The Hateful Eight (2015), Quentin Tarantino’s much-anticipated new film, is a puzzling, disturbing experience. I think it’s safe to say that for most of Tarantino’s filmography, his films often have a focal character which the audience can align themselves with. A character who, if not morally, we can see ourselves agreeing with their decisions and actions. For Kill Bill (2003-2004) we had the Bride. For Inglourious Basterds (2009) we had Lt. Aldo Raine. For Django Unchained (2012) we got the dynamic duo of Django and Dr. King Schultz. And with these characters’ quests for retribution often came extended scenes of dialogue punctuated by brilliantly choreographed action. Tarantino has built himself a reputation as a director who conceives of cinema as a form of visceral experience. With The Hateful Eight, Tarantino abandons this cinematic aesthetic in favour of a more theatre-driven, literary style. The Hateful Eight finds Tarantino at his most thoughtful, political, and meaningful stage of his career. However, the affect this has on the form of cinema is of a somewhat different success. The Hateful Eight is essentially a three-hour conversation between a myriad of unlikeable, detestable, and violent characters, forced into a dialogue by a blizzard and the prospect of having to stay in each other’s company for three days. There is no moral focal point among this cast; each is as unlikeable as the last, and furthermore, no one is quite what they appear to be. Every character is motivated by survival. For in Tarantino’s film, the United States has been filtered into this one room, and to say or be who you truly are is a deadly act. It is liable to get yourself killed. So as the snow forces these characters to talk about themselves and their struggles, conflict inevitably arises. America is the land of kill or be killed, and these characters know that more than anyone else. The Hateful Eight is Tarantino at his most political. It is a film that undeniably has a lot to say about the current state of race relations in the United States, whether you want to hear it or not. Tarantino’s new film is a politically charged, literary experiment in cinematic form. This profoundly new direction for Tarantino matches a new cinematic aesthetic. Gone is the aesthetic of viceral experience as cinema. Here we find Tarantino at his most literary, carefully constructing his characters and relying for most of the film upon the power of wordplay and conversation to drive the characters and dialogue forward. 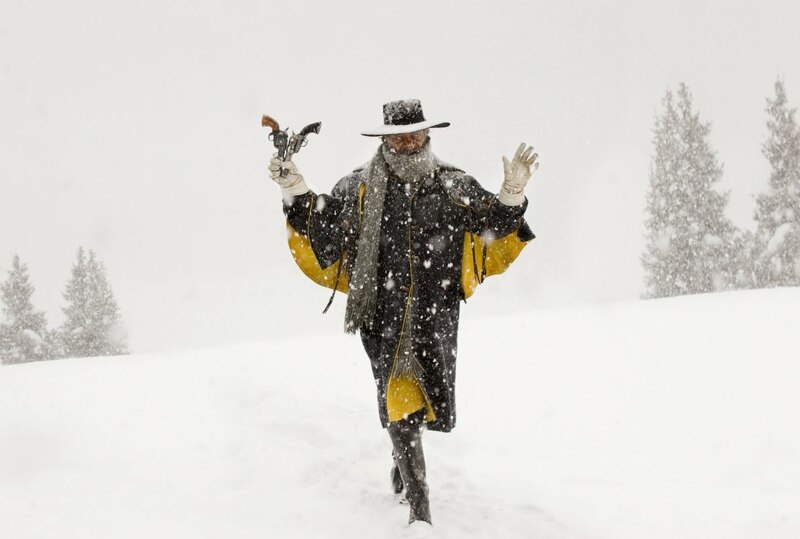 At times, The Hateful Eight is reminiscent of the novels of Leo Tolstoy or Charles Dickens. Whilst conflict may still be finished with violence, The Hateful Eight is a marked departure from his previous films with it’s use of violence. Violence won’t end the larger debates presented within the film anymore. Violence won’t end slavery or stop the Nazis. This is because here, for the first time in Tarantino’s career, the debates these characters represent are bigger than the stage or the actors. This in part leads to one of the best monologues Tarantino has written in his career, delivered by Samuel L. Jackson’s Major Marcus Warren, a black bounty hunter, who converses with Bruce Dern’s General Sandy Smithers, a Confederate general. It’s a standout sequence that is among Tarantino’s most disturbingly funny and political scenes. However, whilst all of this is an interesting departure for Tarantino in filmmaking, it can tax the audience. The Hateful Eight, in it’s 70mm cut, is 187 minutes long with an intermission. It is nearly 2 hours and 20 minutes of dialogue, set up, and build up, to the final act in which most of the significant action happens. It’s a film that rests entirely on the shoulders of it’s last 40 minutes, and whilst all of this is very well executed I was left at points thinking, what exactly is the point of what’s happenning on screen? The Hateful Eight is entirely about subtlety and nuance. Subtlety and nuance across 3 hours of dialogue becomes something of an endurance test, if not an enjoyable one. Tarantino’s 70mm cinematography creates some of the best landscapes of his career. Tarantino also makes great use of the 70mm format, with the opening half-hour stagecoach ride to Minnie’s Haberdashery featuring some of the most beautifully photographed landscapes of his film career. And when the film finally transitions to inside of the Haberdashery, there is no shortage for great cinematography. The faces of the cast, careful and beautiful lighting, and the occasional exploding head all are beautifully captured in 70mm. Likewise, this cinematography is accompanied by the hauntingly gothic Ennio Morricone score, his first Western score for 35 years. It’s a standout score among this year’s selection, and has a very good chance at nabbing Ennio Morricone his first competitive Oscar. All actors are firing on full cylinders, with a career-defining performance from Walton Goggins as Sheriff Chris Mannix and another jewel in Samuel L. Jackson’s ever-growing crown. Kurt Russell and the rest of the cast are also very good, with a particularly note-worthy, Oscar nominated performance by Jennifer Jason Leigh as Daisy Domergue. She is easily the most savagely brutal character of the whole film. She’s manipulative, violent, and all-around nasty. The violence committed towards her throughout the film never feels exploitative or unjustified. I won’t be forgetting her sneering, blood-soaked face anytime soon. Samuel L. Jackson and Walton Goggins are two standouts of an incredible cast. Whilst The Hateful Eight may be a taxing experience, and a somewhat weaker film from Quentin Tarantino after his back-to-back successes of Inglourious Basterds and Django Unchained, it still ranks as one of the best films of the year as well as providing a startlingly new direction in Tarantino’s filmmaking. I hope to see more of this literary, theatrical style from Tarantino in his next films. Seeing the film in 70mm is a must if at all possible. An intriguing, enthralling, and stimulating piece of cinema. Hi Chris – many apologies for the late reply, I’m in the deep end of final year at uni so haven’t had too much time for the blog! Glad to hear you liked the film too – I have yet to read that review but will give it a read now. What did you think of Sam Jackson?